Call today for all your mobility and access needs! 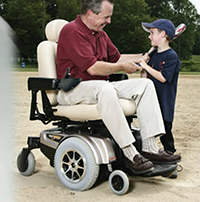 Here at American Lift Aids – Tyler, our goal is to help you get around as easily as possible. If you simply can’t move around as gracefully as you used to, our experts are ready to help. We provide high-quality lifts, scooters, power chairs, modular ramps, residential elevators, and more. Additionally, we can also either sell or rent you a wheelchair-accessible van. We offer an incredible selection of wheelchair vans for sale. American Lift Aids began in Beaumont, TX in 1991, and quickly expanded to include a location in Tyler, TX. 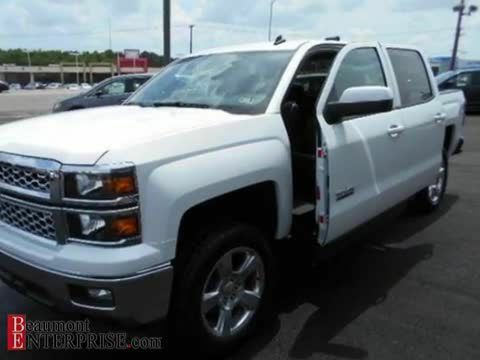 Since then, we are proud to have become the leading mobility vehicle dealer not only in East and Southeast Texas, but also in West Louisiana. We also serve the mobility needs of Longview, TX; Kilgore, TX; Fort Worth, TX; Dallas, TX and all of the surrounding areas. Our staff members are very knowledgeable when it comes to the mobility industry, and are always more than happy to answer any questions you may have about our products. Our goal is to improve your quality of life as best we can so you can still do all the things you’ve always loved to do. We are a family-owned-and-operated company that always seeks to establish lifelong relationships with all of our customers. We maintain an A+ rating with the Better Business Bureau, and have been a BBB-accredited business since 2008. We are proud members of the National Mobility Equipment Dealers Association, an internationally-known organization committed to quality and professionalism in the manufacturing, sales, and installation of mobility equipment. We have also earned the Joint Commission Gold Seal of Approval. The Joint Commission accredits more than 16,000 health care organizations in the U.S., and the Gold Seal of Approval is a nationally-recognized symbol of quality. What’s the bottom line? You can always count on American Lift Aids – Tyler to equip your home or vehicle with exactly what you need, and provide a top-notch customer service experience throughout the entire process. 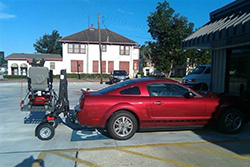 Looking for quality wheelchair-accessible vans in the Longview, TX area? We are a leading source of automobiles and several other products for the use of individuals with disabilities. 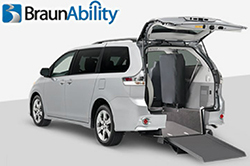 We offer the best wheelchair-accessible vans from trusted brands to keep you mobile. Call today and let us help you meet your unique transportation and travel needs. Our knowledgeable staff can help you choose the right mobility products and assist you with any further concerns you may have. Call today or visit our website to see all the new and pre-owned wheelchair accessible vans we have available to purchase or to rent. We have a wheelchair van to fit anyone and everyone’s price range, and you are always more than welcome to take a vehicle you’re interested in for a spin to see how you like it! We represent all the best names in the mobility industry, including VMI, Braun, AutoAbility, NorCal, Mobility SVM, and Ryno Mobility. Simply let us know what you need, and we’ll have a vehicle all ready to go in just a few weeks! We offer tthe best selection of wheelchair vans for sale or rent to the Tyler, Dallas & Longview, TX areas. With your new wheelchair van, you’ll have little trouble getting in and out to run errands or just go out and about. But American Life Aids – Tyler won’t stop there, not by a long shot! We can help make getting around your home easier too! We provide durable mobility scooters, modular ramps, platform lifts, stair lifts, and residential elevators. Soon, you’ll be going up and down to the different floors in your home with ease. “But how am I going to pay for it?” That’s a question we hear from many of our customers, and it’s certainly a valid one. Don’t worry! We have arranged 10-year financing for qualified applicants through Braun credit and other various lenders. If you choose Braun credit, you only need to fill out a simple, one-page application, and you can apply right over the phone! Further, flexible terms are available on both new and used vehicles, ranging from 36 to 120 month terms. Competitive, low rates are available, even when you’re financing 100 percent of the vehicle’s cost! We also do our best to secure financing as quickly as possible so you can enjoy your new vehicle in no time. In addition, we accept workers’ compensation, Medicare, Medicaid, the VA, and other local and state agencies for additional payments. Furthermore, Texas sales tax and motor vehicle sales tax laws allow those with disabilities to purchase tax-free items and services in certain cases. Most vehicle manufacturers will also reimburse people when they have such equipment installed in their vehicles. We work along with Acura, Chrysler, Ford, GM, Honda, Jaguar, Lexus, Toyota, Volvo, and Volkswagen, all of which have mobility programs for customers to take advantage of. If you need a mobility scooter, we have you covered. We know the importance of the ability to move around where and when desired. Our mobility scooters can help make this possible. We are happy to assist you and hope to make an improvement in your life! Call us today to get more information on our wheelchair-accessible vans. We are conveniently located to serve the Dallas, Longview, and Dallas, TX areas. Read what our customers said about our wheelchair-accessible vans! 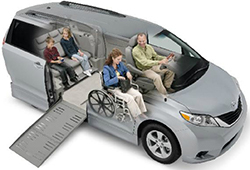 American Lift Aids - Tyler is the largest dealer of wheelchair-accessible vans in the Tyler, TX area. Our mission is to provide one-on-one consultations to determine the correct equipment or modifications for each customer’s individual needs. We have the most experienced consultants, the largest inventory of wheelchair-accessible vans, the best pricing, professional installation, and outstanding services. But you don’t have to just take our word for it. See what our customers have to say for yourself! “I am very satisfied with the service of American Lift Aids. I have tried other establishments that provide vehicles and driving accessories to the handicapped but nothing can rival the services provided here. The time frame allotment for procurement, installation, and fittings were exceptionally small.” – Kenneth Fortenberry. “Good service, friendly people, service and final delivery rated at 95%.” – Terry A., Kilgore, Texas. “We received excellent service from our salesperson. She has a really caring attitude for our situation.” – Thomas S., Woodville, Texas. “I must comment on the owner, Mr. Tim Baker and his staff. He and his staff all just bent over backwards to see that all our needs and concerns were attended to. No matter how trivial our questions, he has handled them all with great care and concern.” – Ellis K., Whitehouse, Texas. “I was struggling to try to help my wheelchair-bound brother get to and from doctor appointments. After checking the Internet, I found you. Now it is as a new lease on life. I am no longer stressed out. My brother is no longer confined to his house! Keep up the good work.” – Jayne L., Chester, Texas. If you’re ready to live a better quality of life, make the call to American Lift Aids – Tyler today at (409) 234-1513. Whether you need to equip your vehicle, home, or both with mobility equipment, our experts have you covered. We’ve helped thousands of people in the Tyler, TX; Longview, TX; and Dallas, TX areas get around more; let us help you next! Call us to see our selection of mobility scooters and wheelchair vans for sale. 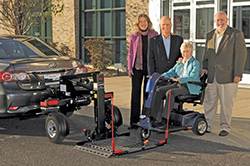 American Lift Aids - Tyler offers mobility scooters, modular ramps, incline platforms, porch lifts, power chairs, patient lifts, wheelchair-accessible vans, and other mobility service products for homes and vehicles in the Tyler, Longview, and Dallas, TX areas. Call us for scooters or wheelchair vans for sale!